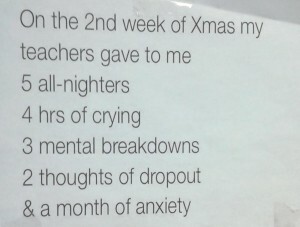 Finals week. Better known as Hell Week (at Georgia Tech). The series of days that stand between you and the holiday break. For many you will endure this plight just eight times during a given undergraduate career, but depending on the courses you take and how long you’re in school, it’s something that can be experienced a dozen times…or more. Attending a school who ranks last in a recent college publication’s survey of most manageable workloads, doesn’t provide any consolation, but it does offer the ability to improve with each passing semester at keeping oneself motivated through the end. With your back up against a wall it’s fight or flight. The comprehensive final exam can mean the difference between passing a course or repeating it. During my time at Georgia Tech I never really appreciated it, but looking back four years after graduation, I have a new found understanding of some of the tangible benefits I received during the most difficult time of the year. Below are some tidbits that I believe have translated well into my professional career that I most notably experienced firsthand during Hell Week at Georgia Tech. Seems like a no-brainer, but let me delve deeper. My freshman year I had a roommate that was brilliant. Knew all of the material inside and out and would constantly outperform all of our peers in the class. However, this particular individual was a disorganized mess. His room reflected it and come Finals Week, it only worsened. I remember vividly both semesters that year him complaining that he was unable to get an A in a course because he had failed the exam. Not because he wasn’t familiar with the material, but because he had no idea that the exam was not comprehensive and only tested the most recent material – something he didn’t cover because he ran out of time. Study the syllabus put forth by professors handed out. Know the percentages of the final exam and exactly what you need to do to maintain or achieve the grade you desire. If you have several exams in a given day, take the time to make an analysis on which ones you need to devote the most time for and plan it out. At the end of every day during finals week I would reassess where I needed to be and modify my timing for studying to reflect that days progress. 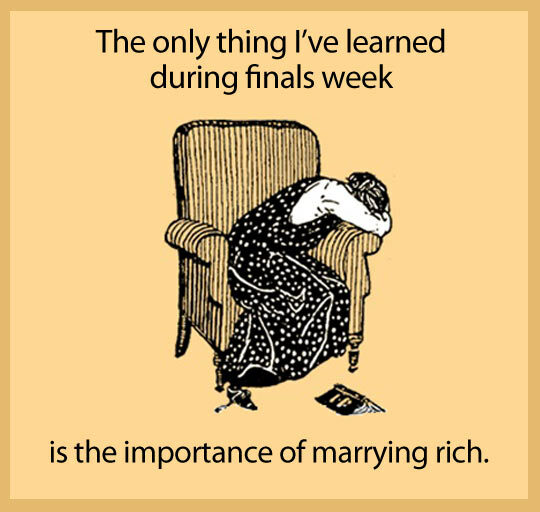 Finals week is a marathon, not a sprint. You have to regulate when to turn on the afterburners and give it all you’ve got. Georgia Tech’s biggest asset is its ability to teach people how to teach themselves. A lot of folks reference the 80/20 mentality, also known as the Pareto Principle, which states that you can accomplish 80% of what you’re striving for with a 20% investment. While the obvious application for finals week would be in knowing the material and what will be covered on the exam, Tim Ferriss is living this principle and teaching himself new skills. Ferriss, best known for the 4 hour workweek, is now producing segments on Upwave called the “Tim Fereiss Experiment”. In this most recent episode, Ferriss attempts to learn to play the drums in a matter of a week, to play alongside a world-class band LIVE on stage at their next performance. He explores the ability to teach yourself any skill in a short period of time through the right formula. Much is true today in the workplace. As a freelancer, I am juggling projects on a day-to-day basis that changes; hourly. I try and relate each of these projects similar to that of different courses I took while in school. Maintaining an updated calendar and understanding the projects’ top needs and desires I am able to hit my deadlines while still completing the project and satisfying the client’s needs. In a recent video project, I knew that an over-the-top graphical treatment on an intro/outro would look great, but also knew it would take me at least half of the hours I had proposed for the project. Keeping it simple, I was able to address the audio needs that were more integral to the project’s completion as it was a piece that was to be more a testimonial than a showcase of my motion graphic capabilities. One of the best pieces of advice I could give for any course was getting to know my peers. Everyone in that room had strengths and weaknesses and I viewed the classroom as a collective environment where everyone was out to help everyone around them collaboratively beat the system. On the first day of class I had a rule – get to know three new people in the course you could jive with over the course of the semester to help you study, help you in case you missed coursework, and similarly you could help. Semesters are a period of four or five months where you get to know the individuals around you. 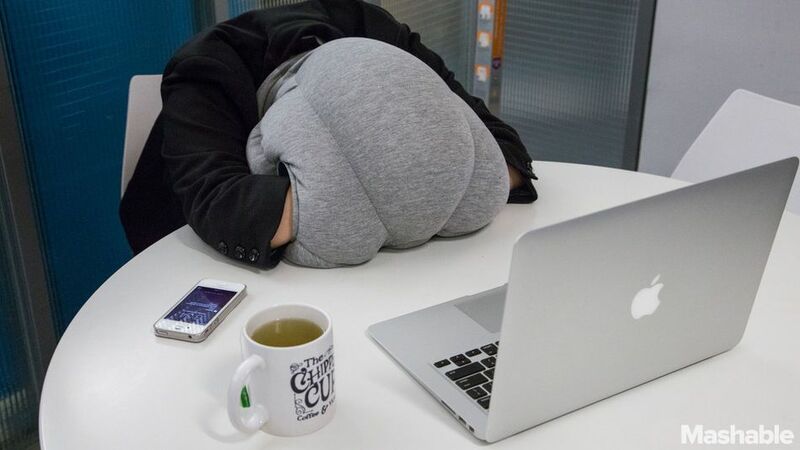 When it comes finals week, who better to lean on than the folks that got you there. Study with them, let them be your support group and lean on them while also reciprocating. On countless occasions it is these same individuals that came through to assist me with offering quick tricks and tidbits they’d encountered that were a different approach for solving a problem that I may otherwise have never seen. I learned more from my peers posing questions than the professors preaching. Such is true today in a professional setting. Working on a team where there are shared responsibilities gives everyone a little buy-in to the final outcome. Taking an interest in others’ projects and successes not only gives you a bit of transparency to other inner-workings of the team, it offers you the ability to prove yourself an asset with a genuine concern for collaboratively producing a polished end-product. Reciprocating kindness can provide returns on your investment too. Something as simple as a late night team gathering to finalize a project can be made that much more enjoyable by just picking up the tab on the late-night pizza for the group. While a simple gesture for a manager or leader, your efforts won’t go unnoticed and your employees and team members may take greater pride in producing a better result than just for the sake of getting it completed. Researchers have proven breaks are necessary to keep your attention. The nature of attention demonstrates that even brief diversions fro ma task can dramatically improve one’s ability to focus for prolonged periods. During Finals Week Georgia Tech offers one night that has a built-in reward system – the Midnight Breakfast. The regular treat offered a free escape from studying and I always tried to plan it in such a manner where I would only go after completing a certain number of problems or accomplishing that day’s to-do list tasks. I recall late nights in the library, I would only reward myself with the famous Lucky Buddha treat after I had completed X chapters of reading or at a certain time. This planned break served as motivator and had some sort of buy-in for me. “You need stimulus and recovery in mental work in the same way that you need stimulus and recovery for sports. Your body needs time to regenerate neurotransmitters, so it’s in your best interest to take breaks. There is a reason why power lifters take five to six minutes to rest between sets, the energetic system takes that long to replenish properly. You have to have an awareness of the fact that just because you’re not moving your body doesn’t mean that you aren’t working.” Ferriss explains in his interview with FastCompany. One needs to reward themselves with sleep too. Lack of sleep in the past has caused fatal mistakes, such as the New Yorker earlier this week who fell asleep behind the controls and derailed a train. All gas and no brake makes the brain not function well. You know yourself best. What motivates you? Food? Shopping? Facebook? Create a carrot to lead you to your end goal and stick to it! You hear this a lot from students who weren’t necessarily challenged during high school or who always were accustomed to receiving good grades without studying. Then they attend a difficult university that is thought to set students up for failure. I was one of these students, and I failed a number of exams during my tenure. I’m not talking about a grade in the 60s, I’m saying I was ready to drop the course after receiving a single digit written in red pen (out of 100) on the top of my test. I learned very quickly, you can’t dwell on a past performance – You just have to pick up the pieces and march on. I learned very quickly, you can’t dwell on a past performance – You just have to pick up the pieces and march on. Use this as a springboard and opportunity to find yourself. Find what works for you and what makes you tick, most successful. I figured out during this time that I am a night owl. One who works best with Paul Oakenfold blasting trance in my ears after 2am, and that has been a finding I hold dear to this day when I really need to grind out a project. Ensure that even if you don’t come out of school with a 4.0, you’re able to identify with yourself and get to know your limits. 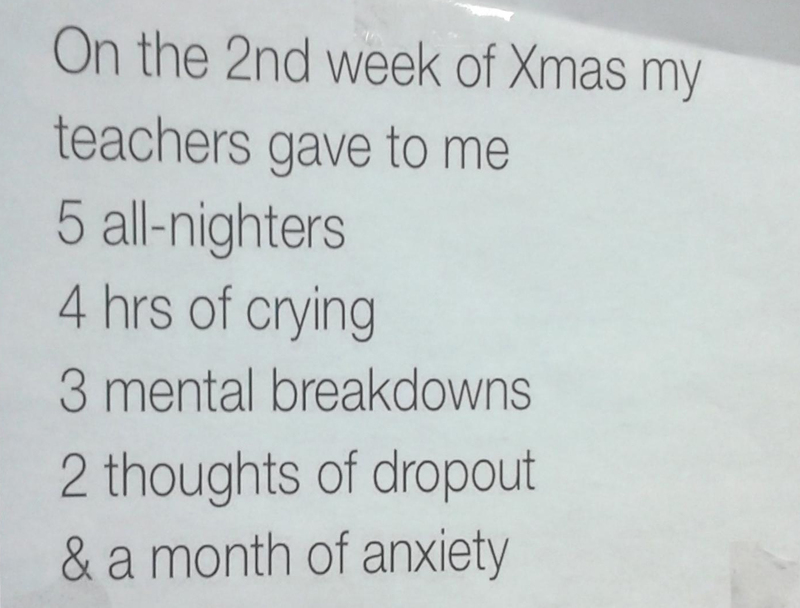 Finals week is just that – a week. It is up to seven days long, and whether you want them to or not, the hours and days will pass. Know that there is an end and give it your all. It’s something you have the capacity to get through, and this, too, shall pass. 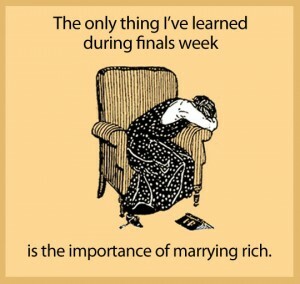 What has Finals week at your University taught you? Anything else you’d add to the list?